Can I Make a Cake Mix in a Ceramic Dish? What Kind of Pan Do You Need to Bake Brownies? Look for thick, sturdy pans when selecting bakeware. 3 What Is Better for Cookware: Glass, Stainless Steel or Silicone? 4 Can I Make a Cake Mix in a Ceramic Dish? 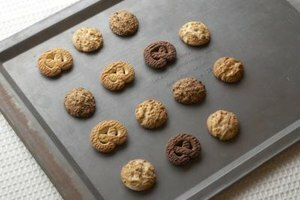 Any home baker who has ever pulled a tray of cookies out of the oven to find them raw in the center and burnt around the edges knows how frustrating it can be to fall victim to uneven heat distribution. There are a few factors that can influence how evenly something cooks in the oven, including the oven itself. One way within your control to ensure a delicious, properly cooked final product is to get to know the baking sheets that will carry a recipe through the cooking process. The evenness of heat can have a profound effect on a finished dish. When heat doesn't distribute evenly, it can cause overcooking in some areas of the pan and undercooking in others. This is particularly problematic when baking cookies, because they are generally quite thin and are more susceptible to burning than other baked goods. Cookies arranged along the edge of a pan can overbake by the time the cookies in the center are done. 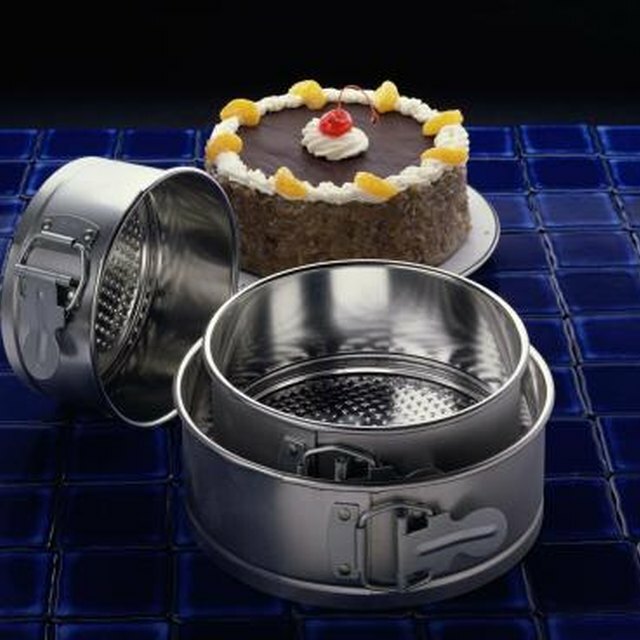 For cakes and cupcakes, even heat distribution prevents the top layer of cake from burning or becoming too crisp while a cook waits for the center of the cake to reach an acceptable level of doneness. When the sides of a cake bake hard more quickly than the center, the result is a tall dome that must be sliced off -- wasted -- before frosting, unless you can live with a lumpy cake. Nonstick baking sheets are generally made from aluminum or steel and coated with a nonstick coating that lets food slide easily off the surface of the pan. Because the nonstick coating gives the pan's surface a darker color, the baking sheet absorbs heat more quickly. This speeds cooking time and can cause burning or drying as a result. To adjust for the quicker cooking time, try lowering the recipe's suggested oven temperature by 20 degrees when you use nonstick baking sheets. This adjustment should also be made when cooking with other dark-colored baking sheets, such as tinned steel or hard anodized aluminum. Aluminum is a good choice for baking because it is a very even conductor of heat, which means there is a low risk of burning or drying. However, aluminum is typically light-colored and quite shiny, which can impede the browning of a baked good. Look for thick, sturdy aluminum pans, as thinner varieties conduct heat less evenly and can bend at too-high temperatures. Restaurant supply stores carry sturdy pans that heat magnificently, but before investing in them, make sure they'll fit in your home oven. Stainless steel baking sheets are also plentiful, but the material conducts heat too rapidly to hold an even temperature throughout. Tinned steel, however, which is made by pressing multiple sheets of steel together and covering the pan with a thin layer of tin, heats much more reliably. Tinned steel is dark in color, so be sure to lower the oven temperature while baking to prevent overcooking. If you're in a situation where you're stuck with bad pans, you can make the most of what you've got. To improve heat distribution, rotate the pan 180 degrees after two-thirds of the suggested cooking time has passed. When baking with darker baking sheets, lower the oven temperature to adjust for the shortened cooking time. If using a lighter, thinner baking sheet that has burned cookies in the past, try baking smaller amounts of dough at a time so that the heat has a better chance of spreading through the entire cookie before edges begin to burn. Keep the cookies away from the pan edges, where they're most likely to burn. Jessica Johnson is a graduate of Knox College, where she earned a Bachelor's degree in environmental studies and socio-cultural ecology. Her work has appeared in the "West Linn Tidings" community newspaper and "Fusion" theology journal. She is the blogger and recipe developer at Life As A Strawberry and the founder of The Sustainable Seafood Blog Project. What Are the Benefits of Stoneware Baking Pans?